Getting my hygge-inducive knit on now that the temperature has nicely dropped and it’s appropriate to think about all things Cosy. It’s fun to do on the commute/in down-time. Adelyn lost her only scarf on our recent trip to beautiful Edinburgh. I wandered into some gorgeous boutique for kid’s clothes and picked up an adorably chunky knitted scarf and promptly dropped it in disgust at the £35 PRICE TAG – ARE YOU EFFING KIDDING ME?!?? Then realised that I could whip together a scarf with my own two hands. This is a simple-ish pattern I devised, the subtle “points” at each end lend a little something extra in detail to what is otherwise a pure knitting pattern. 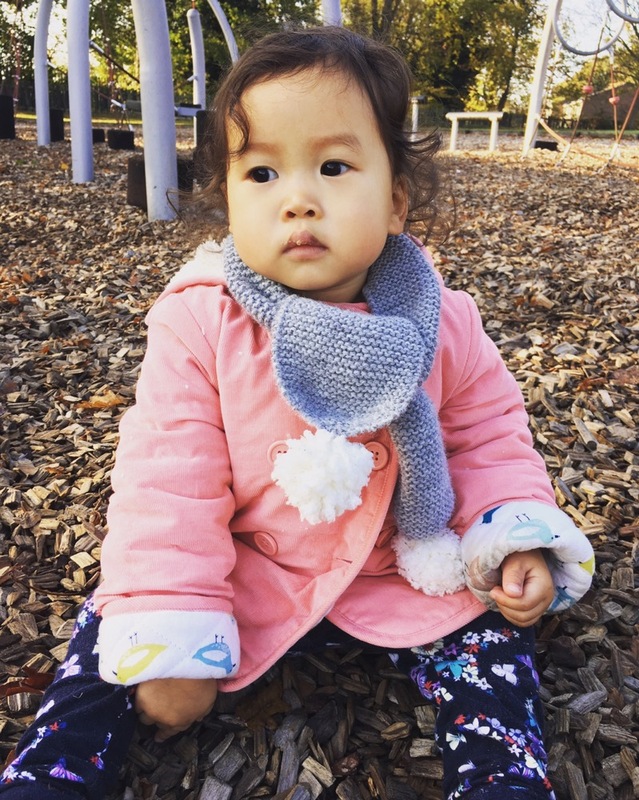 Add two pom-poms and you’ll have a delightful little homemade scarf to adorn upon a little one in as little time as a weekend. If you need any help whatsoever with the graduations to increase/decrease your stitches to get the (what are essentially) triangle shapes at either end of scarf, I use the lovely videos from Purl Soho to show me! Repeat step 5 and 6 till you have 21 stitches.